A friend of mine attended an entrepreneur’s conference in Baltimore last week. He learned that 90% of the business owners present had a “company” Facebook page­­ set up, but only 46% had a claimed Google + Business page. I found this interesting considering Google (and Bing) local listings almost always rank above social pages on a typical search engine result page. I began to wonder why so many local businesses were ignoring online search as a source for lead generation. However, after some research (a few dozen local searches) I found that while most businesses aren’t necessarily ignoring online search, many of them are simply doing it wrong. I was happy to see that business owners are integrating social media into their marketing mix. Social networks like Facebook and Twitter can be powerful for brand awareness, but when people are looking for or researching specific products and services, most social channels trail to search engines. This is especially true when it comes to the astounding number of location-specific searches. Google has stated that 20% of searches are location-related queries. With Google’s nearly five billion searches a day, this equates to about 30 billion local searches per month, and that number is expected to increase 50% each year. As I mentioned earlier, many business owners have local listings, but are doing it wrong. Simply typing in your business name and seeing your listing isn’t enough. Be sure to “claim” your listing so that you can complete your profile and business information in full. This includes pictures and videos of your establishment, types of payment accepted and even whether or not you have paid or free parking available. You can read about this and more on Google’s User Guide. After you’ve created your local listing profiles, you’ll need to rank higher than your competitors in order to capture as many visits as possible. This is a no-brainer, but unless you’re up to date on today’s SEO best practices it’s easier said than done. Whenever possible, include a keyword with your business name (if it makes sense). 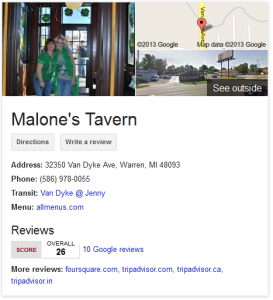 For example, let’s say I owned a tavern named Malone’s in Warren, Michigan. 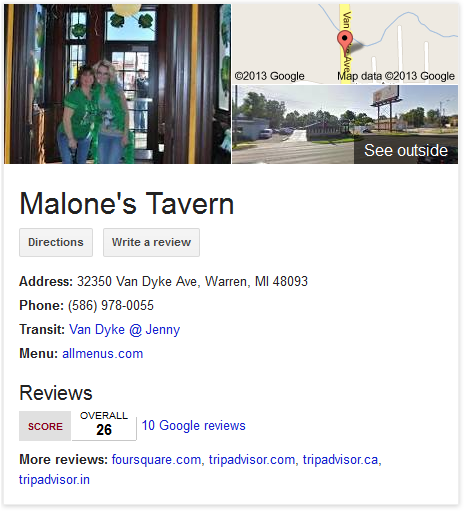 For Malone’s to rank highly for the search term, “taverns in Warren, MI” I’d want to set up my listing name as Malone’s Tavern. This will provide better visibility for “tavern” related searches, even though the business license might actually be, Malone’s Food & Beverage. This might sound obvious to some, but I see companies miss out on potential visitors all the time. You can also fail due to penalties. If you over-optimize your business name with too many keywords or if you use nothing but keywords i.e., “Best Tavern for Happy Hour in Warren” you’ll likely receive a penalty and be denied your local listing. Since not everyone will have the same semantic understanding of your service it’s important to add variations of the product/service in the categories section. 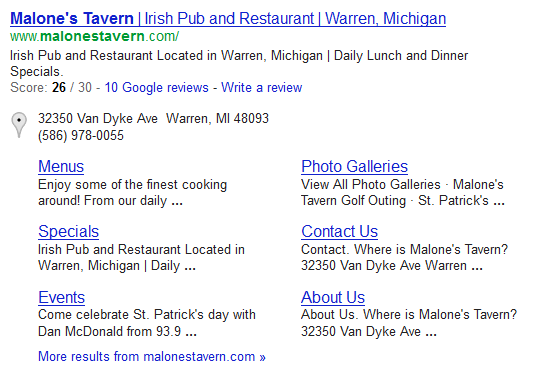 In the example of Malone’s, it’s important to add phrases such as pub, bar and grill, bar, happy hour, restaurant, etc. to help receive additional traffic from these key phrases. There are many tactics for getting people to leave reviews on your local listing pages. Whatever you decide, be honest. Don’t get tricky or leave fake reviews on your local listing pages, it doesn’t work. Google has been clear about this. I’ll leave some resources at the end of this post to help you find an ethical method for enhancing your business pages. Most SEO analysts agree that you’ll see the most benefit after receiving your fifth review. You’ll see even more benefit if you maintain a consistent number of new comments. Users may give you a rating of 1-5. Having a rating of 1 seemed to hurt rankings the most while anything above a 3 seemed to help. Google often displays this as poor-fair (1-2), good (3), very good (4), and excellent (5). There is a lot of data telling us the more you use Google+ for sharing and engaging online, the more you are rewarded in search. Google Executive Eric Schmidt has stated that content tied to author profiles will rank higher than content that doesn’t have such a connection. Even more, there have been multiple controlled experiments similar to this one from Media Bistro that positively correlates a website connected to a highly active Google+ account can increase rankings up to 14 positions in search results. Local businesses can doubly benefit from joining the Google+ bandwagon since both their local listing page and their company website can rise in the results, capturing additional visits. Schema is still a relatively new internet marketing strategy. It’s a type of markup [code] meant to be added to your website to make it easier for search engines to categorize and identify important information. Including schema on your website can help generate optimized rich snippets and improve overall ranking in search. It helps display extra information such as product pricing, business hours, testimonials and reviews, food menus, event information and detailed geographic information. Since you now have a claimed Google+ Business page Google will be able to share schema information and display it on your local listing search result. Having this type of markup in place will increase your chances of showing results that include Google reviews, address & phone numbers, additional site links, event information and more (see image below). That’s a lot of real estate to own and your click through rates will benefit because of it. There is a great [free] tool you can use to generate this code automatically at 51 Blocks. I found this easy to use and suggest giving it a try. Even today, less than 25% of all local business owners in the U.S. have a website let alone think about local search as a channel for new customers. That’s a lot of opportunity for local businesses. I hope this gave you a better understanding of how to enhance your own local listings and start leveraging search engines.